Leathem (Lurgan) February 8th 2019 peacefully at home. Harry dearly beloved husband of Margaret 19 Drumlin Drive, Taghnevan, and much loved father of Pauline, Ann, Sandra and the late Barbara R.I.P, beloved father-in-law of Paddy and Andrew, loving granda to Danielle, Mark, Ryan, Niall, Matthew, Conor, Niamh and Ciara and great granda to Sophie and Hollie. Funeral on Sunday at 11.30am from his home to St Paul's Church for 12.00noon Requiem Mass. Interment afterwards in St Colman's Cemetery. Very deeply regretted by his loving wife, daughters, sons-in-law, grandchildren, great grandchildren and family circle. 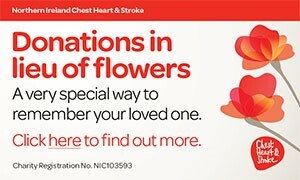 Family flowers only please, donations in lieu if desired to Chest, Heart and Stroke Association c/o Jack McLearnon & Son Funeral Directors 75 North Street Lurgan BT67 9AH. I am sorry to tell you that Harry LEATHEM has passed away.